Ceiba Renewables have installed an 8.04kWp Sunpower solar PV system at the Scottish Maritime Museum in Irvine, Ayrshire. The system will generate in excess of 6,800kWh a year that will supply power to run their offices, workshops and the museum itself. The Maritime Museum holds an important nationally recognised collection, encompassing a variety of historic ships, artefacts, shipbuilding machinery, machine tools, and fascinating personal items. Many of these exhibits can be found inside the Linthouse Building in Irvine, a unique Grade A listed, 19th—century historic building known as the Linthouse Engine Shop ‘Cathedral of Engineering’. 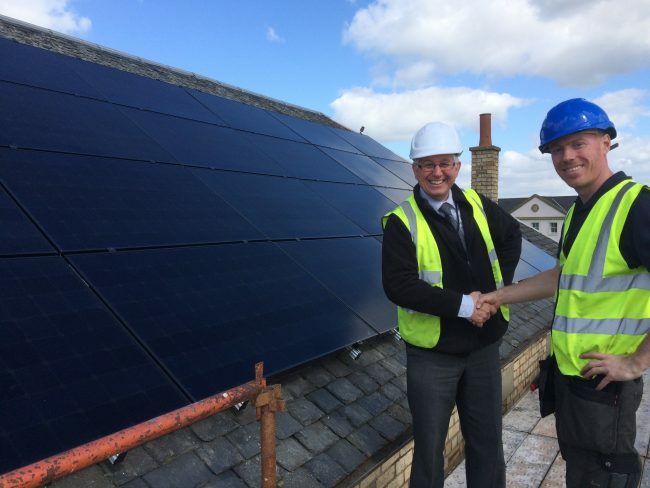 The solar PV installation uses the most advanced solar PV technology which was chosen by the Scottish Maritime Museum in order to deliver maximum solar yields and unprecedented durability. The PV system utilises Sunpower X21 335W all-black panels and SolarEdge power optimiser inverter technology. Sunpower’s X21 series of panels hold the world-record for efficiency of any commercially available panel and uses their Maxeon technology which delivers superior performance and greatly enhanced durability over conventional solar PV panels. The SolarEdge power optimiser technology further improves the yield of the PV system, gives firefighter safe isolation of each solar panel and provides detailed monitoring so that should a fault ever develop it can be identified and fixed quickly and with minimal hassle.